Spare Candy: Guest post: "The Bechdel Test: Women in Movies"
Today's guest post comes courtesy of Gunter Jameson, who writes about several topics including travel, minimalism and online classes. If you're interested in writing a guest post for Spare Candy or cross-posting something, check out the guidelines or send an e-mail to rosiered23 (at) sparecandy (dot) com. In the last 50 years, Hollywood has made some great strides to include more well-rounded female characters and create more good roles for female actors. But just because there are more roles for women doesn’t mean that the parts that these women play are getting much better or living up to any type of feminist standard. In fact, one theory of movies will give you a whole new perspective on feminism in pop culture. It’s called the Bechdel Test. Some proponents of the Bechdel Test also add that there has to be more than one woman in the motive who have names. (Learn more here.) The test itself is not even a measure of whether or not the movie is feminist, but rather is simply a test to find out if the movie portrays an active female presence and if the characters are well rounded. Even movies that appear on the surface to be pro-feminist movies can’t pass the test. For example, Salt, starring Angelina Jolie, features a strong, female CIA agent who fights through a number of obstacles (fists and guns flying) to uncover a conspiracy against her. A strong, confident female lead like this would surely pass the test right? But it fails all three questions right off the bat. 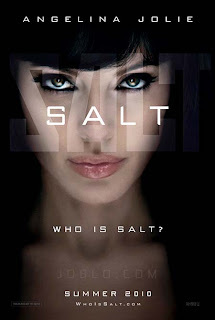 Evelyn Salt, Jolie’s character, is the only woman in the movie. With this in mind, think about your favorite movies, the movies you’ve seen lately, or the movie you’re going to go see this weekend. Does it have more than one woman (who is named), do they talk to each other, and do they talk to each other about something other than the men? The answer may surprise you. Editor's note: What are your favorite movies that pass the Bechdel test? What movies do you love that don't pass it? Also, I recommend checking out this blog post on the Bechdel Test and race.